Nested Naturals Turmeric Review – Is This Product Safe To Use? Nested Naturals Turmeric is a special supplement designed to help people who suffer from persistent pains, especially pain caused by arthritis. Taking this supplement every day can help such individuals lead better and happier lives. The manufacturer, Nested Naturals, utilizes a unique process of extraction to guarantee a high potency of pain easing curcuminoids. What is Nested Naturals Turmeric? Individuals who continuously suffer from chronic pains can significantly benefit by taking Nested Naturals Turmeric supplement every day. The supplement blends organic turmeric extracts with black pepper extracts to help improve the health of the user by targeting inflammation within the bop. The supplement’s mechanism of work is perfect for individuals with digestive problems or people living with arthritis. Moreover, the supplement helps improve the strength of the user’s immune system to help the body resist diseases, illnesses, and infections better. What is the Company Behind Nested Naturals Turmeric? Nested Naturals Turmeric is a product of Nested Naturals. The company cares a lot about what people put in their bodies. Nested Naturals is committed to helping people around the world to optimize their wellness and health. Its product design process places its consumers at the center where it continually asks them what they most need and want. The company believes in food’s natural healing power and relies on evidence-based science to formulate its products. Nested Naturals also believes in sustainability and strives to make excellent choices for the entire world. Nested Naturals has many years of experience manufacturing high-quality supplements for people. Its products are non-GMO and mostly vegan. The company claims to source only the best raw material available when making its unique products. Moreover, the company is known to set high processing standards for its suppliers to guarantee the best quality. Nested Naturals tests its products throughout production to ensure the purity of its products. After production, its products are analyzed by third party labs to check for contaminants and authenticate the ingredients. All its supplements come with a lifetime guarantee meaning that if a user isn’t happy with their supplement for any reason, they can get their money back. What are the Ingredients Used in Nested Naturals Turmeric? Nested Naturals Turmeric Review- Does It Actually Work? 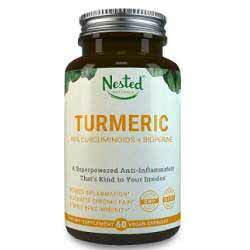 Nested Naturals Turmeric contains a tested formula that provides important nutrients to the body. Because turmeric has anti-inflammatory features, combining it with black pepper relieves the user from digestive problems and chronic pain. Moreover, the supplement helps improve gut health. Curcumin helps lower the levels of body enzymes that cause inflammation. Additionally, black pepper has been shown to help in pain alleviation naturally. Therefore, using these ingredients together helps reduce pain and inflammation and maximize health benefits. What are the Pros of Nested Naturals Turmeric? What are the Cons of Nested Naturals Turmeric? What Are The Possible Side Effects Of Nested Naturals Turmeric? This supplement is formulated using natural ingredients, and users have not reported any side effects yet. Nested Naturals Turmeric contains potent and active natural ingredients that will help provide relief from your chronic pain. Individuals with arthritis will find this supplement very useful because it will aid minimize swelling of their joints. By using this supplement accordingly, the user may notice a considerable reduction in inflammation because the vital extract in the formula, curcumin, has been shown to minimize the levels of the two enzymes responsible for inflammation in the body. Taking this supplement may improve the immunity of the user since turmeric has robust antioxidant features that help fight disease-causing free radicals. Additionally, it may aid in the treatment of infections and wounds thus improving the user’s overall health. This supplement can also enhance gut health. One of its ingredients, turmeric, can treat digestive disorders. Therefore, the supplement may help improve digestion and provide protection against infections. Users can buy Nested Naturals Turmeric online. A single bottle contains approximately sixty vegan capsules. The product is GMO-free and contains no gluten. However, nursing and pregnant women are advised to seek professional guidelines before using the supplement.